يقع Meriton Suites George Street, Parramatta الأنيق على ضفاف نهر باراماتا، ويضم مسبح داخلي ومركز للياقة البدنية وحوض استحمام ساخن، كما يتمتع الضيوف بخدمة الواي فاي الغير محدودة مجانًا في مكان الإقامة. تحتوي جميع الأجنحة المكيفة على مرافق غسيل الملابس وتلفزيون بشاشة مسطحة مع قنوات الكابل ومشغل دي في دي، وتضم الاستوديوهات مطبخ صغير، كما تشتمل جميع الأجنحة الأخرى على مطبخ مجهز بالكامل، وتتوفر فرشاة ومعجون أسنان عند الطلب وهي رهن بالتوافر. يقع مجمع الشقق على بعد 10 دقائق سيرًا على الأقدام من كل من مركز ويستفيلد باراماتا للتسوق ومحطة قطار باراماتا ومسرح ريفيرسايد الشهير، ويبعد مكان الإقامة مسافة 15 دقيقة بالسيارة من كل من حديقة سيدني الاولومبية ومنطقة كودوس بانك للعروض الترفيهية (الفونز أرينا) وستاد إي إن زد وويت آن وايلد سيدني. توفر العديد من المطاعم المحلية خدمة توصيل وجبات الطعام إلى الجناح الخاص بالضيوف، وتقع العديد من المطاعم والمقاهي ضمن مسافة 5 دقائق سيرًا على الأقدام. الدفع: يرجى الملاحظة: الدفع النقدي غير مقبول في مكان الإقامة. ويجب القيام بجميع عمليات الدفع ببطاقة الائتمان. يجب دفع تكلفة الإقامة، بالإضافة إلى تأمين ضد التلفيات عند الوصول. ويمكن استرداد هذا التأمين عند المغادرة. يتم تحديد مبالغ التأمين التي يتوجب دفعها على النحو التالي: - الاستوديو/الأجنحة من غرفة نوم واحدة: 200 دولار أسترالي كحد أقصى - الأجنحة من غرفتي نوم: 400 دولار أسترالي كحد أقصى - أجنحة من 3 غرف نوم: 600 دولار أسترالي كحد أقصى بطاقة الائتمان: يُرجى الملاحظة بأنه سيتم تطبيق تكلفة إضافية قيمتها 1.5% عند الدفع ببطاقة الائتمان. ولا تخضع EFTPOS لهذه التكاليف. يجب أن تتطابق بطاقة الائتمان مع بطاقة هوية صالحة عند تسجيل الوصول. يقبل مكان الإقامة الدفع ببطاقة الائتمان يونيون باي. يرجى الملاحظة: سيقوم هذا المكان للإقامة بإجراء تفويض مسبق على بطاقة الائتمان عند الحجز. ويرجى التأكد من وجود رصيد كافي في بطاقة الائتمان لضمان تأمين حجزكم. أنواع الأسرّة: تحتوي جميع غرف النوم (باستثناء الاستوديو والأجنحة القياسية) على سرير كينغ يمكن فصله إلى سريرين مفردين. يُرجى من الضيوف إعلام مكان الإقامة مسبقًا قبل الوصول عند الرغبة في فصل الأسرّة. يمكن للضيوف طلب ذلك في خانة الطلبات الخاصة عند الحجز. ليلة رأس السنة الجديدة: سيتم اقتطاع تكلفة الإقامة في ليلة 31 ديسمبر/كانون الأول عند الحجز (أو في يوم العمل التالي). كما يتم تطبيق شروط وأحكام إضافية، لذلك يُرجى الاتصال بالفندق للحصول على المزيد من المعلومات باستخدام بيانات الاتصال الواردة في رسالة تأكيد الحجز. حجوزات المجموعات: يُرجى الملاحظة بأنه سيتم تطبيق سياسة فندق مختلفة على حجوزات المجموعات من 7 غرف أو أكثر. ويُرجى الاتصال بمكان الإقامة باستخدام بيانات الاتصال الواردة في رسالة تأكيد الحجز للحصول على المزيد من المعلومات. I was wary at first at the thought that it's an apartment. There is no difference between the quality of Meriton and probably a 4 star hotel except that Meriton has full size ref, dish washer, dryer, utensils and more... It's awesome and their service is great. I CAN LIVE HERE!!! I'm a fan now. Meriton George Street is within fair walking distance to the shops and restaurants. I paid for carpark during my stay which is reasonably priced. The apartment is bigger than I expected. The laundry is downstairs and the living room , bedroom/bathroom and kitchenette are upstairs. The place is clean, very comfortable. Like the free WiFi too. A home away from home! - Price was discounted :D - Location was great, had the train, ferry or bus and also west field, which was a 20min walk down the road - Facilities such as the gym and the pool was awesome. - Staff were very helpful and also the cleaners were always doing an awesome job I booked the single room and everything in the unit was as I had pictured it. Enclosed balcony, split air condition, bath tub, washing machine and dryer. Kitchen with pots, plates etc. The only issue was the noise that would pass through the walls. 1st time staying in this apartment with elderly parents and a child. The room offered was huge and simply beautiful with a river view at TOP floor. However, I had to reject and ask for a room change because the room was split lever 2 floors. My dad was in a wheelchair and climbing stairs was not possible. Was given a smaller room with single level instead. Room although smaller was just as cosy. The staff was also Friendly and service oriented. Location not to bad, food were available around the apartment. Overall excellent experience.. It was a wonderful 3 nights we done it. It s very nice located hotal was very tidy and clean all organised well. It wasnt feel like staying at the hotel feel like a home. If the hotel can offer FOC of parking service its will be fabulous ! Cos, per day charged AUD25.00 is a bit overcharged like us foreigner. My stay at the Meriton was very comfortable. Staff were very welcoming, the room was spotless, everything was working and the location was ideal. Close to lots of nice restaurants and shops. I definately would stay here again. Oh and the bed was like sleeping on clouds, soo comfortable! The location right next to the Parramatta ferry wharf is ideal for those travelling by ferry from Circular Quay. we stayed in a 1-bedroom apartment which was very spacious and well maintained. service was excellent, the check-in staff was very helpful and even provided my family with the train schedule for planning our trip to blue mountains by train from parramatta train station. my family loved the heated spa pool which was a wonderful way to relax after a day trip to blue mountains. Parking costs extra. They charge $26 a night on top of your room cost (Go figure). Besides if you want to check in, no parking available to get out of the car and approach the reception. Once in, it is great. Other facilities r great. Beautiful gardens and view of the river. the apartment was spacious, clean and the staff were excellent. the first time ever to be met at the door and have our bags taken in for us. the Concierge was so friendly and helpful could not fault this apartment. Loved our stay. Thankyou so much. If you are getting married in the west. This is a great hotel. Wife stayed with the bridesmaids the night before and they all loved it. We stayed after our wedding and it is absolutely ideal. We stayed in the 2 bedroom city view. Absolutely stunning. Everything is done right from the View to the linen. Lots of space. I will not recommend any other place in Parramatta. These apartments are located very near to the main street with many restaurants and shops, however the rooms are enclosed around a large courtyard which makes them a peaceful environment to relax and sleep. Very large rooms with large balcony! Very spacious apartment with all the facilities. Walking distance to shops and Westfield shopping mall. Staffs were really helpful. Though the apartment look a very clean and tidy, the carpet, curtain and bedding needs sanitising. My whole family got sick during the 4 days stay. We enjoyed our stay at the Meriton. Staff were always helpful and accommodating, and the rooms were just huge and spacious with everything you need. Just a few minutes walk from Parramatta station, it's very convenient! Overall, I was extremely pleased with my stay at the Meriton. Beautiful spacious room with a large balcony to enjoy drinking some wine on in the afternoon with a decent view. Very comfortable and clean. Average at Best - this is 2015 | Standards need to be maintained. 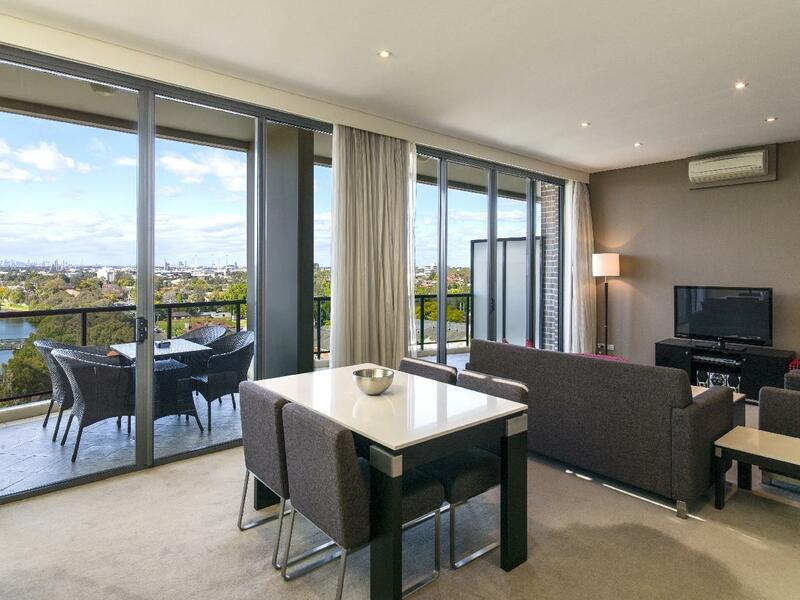 in general I find Meriton Serviced Apartments fantastic. - and stay at them often not this again.... A. not serviced! B. when a customer asks for towels and Tea Spoons - give it to them! completely over rated - give me a break! Located right next to Parramatta wharf, it is nice to take a stroll along the river. Also, there is a bus stop right outside that brings you around the town free of charge. The apartment is fantastic with clean and equipped facilities. Definitely one of the best apartments I've stayed before.